For many sleepers, using an adjustable base can take relaxation to the next level. Adjusting the angle at which you rest can transform your bed into a customized oasis of chill where you can do a crossword puzzle and catch up on your shows, while never leaving the warmth of your bedroom. But when it comes to the adjustable base from DreamCloud, changing positions isn’t all this bad boy can do. So, in this review, I’ll be taking a close look at the DreamCloud adjustable base. I’ll show you how to set up, how it works, and all the fun features it has to offer. If you like to sit up in bed, raise your legs or need both for an anti snore feature the DreamCloud adjustable bed is a great choice! Click here to get yours today! How Do I Set Up The DreamCloud Adjustable Base? 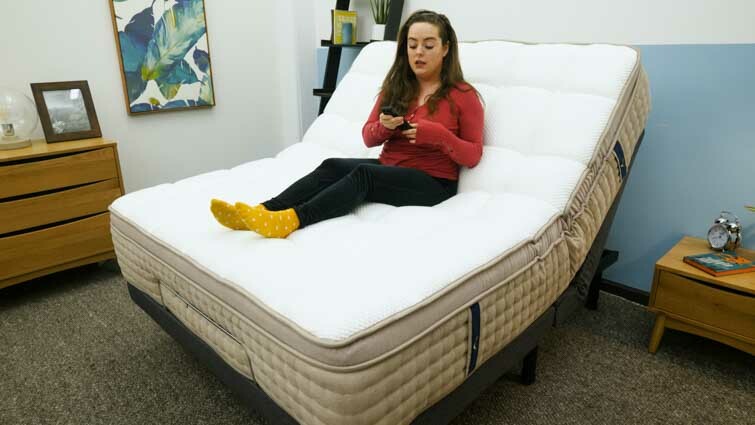 Before I get into the setup of DreamCloud’s adjustable base, I want to note that while this base was built with the DreamCloud mattress in mind, you don’t need a DreamCloud mattress to enjoy this base. Any mattress compatible with the dimensions of the base will do just fine (if you have a Queen mattress, choose a Queen size base). Now, when it comes to assembling the adjustable base, you’ll be glad to know it’s pretty easy and requires no tools. However, it is mostly made of metal and is therefore quite heavy. So, if I were you, I’d take advantage of the white glove delivery service the company offers. 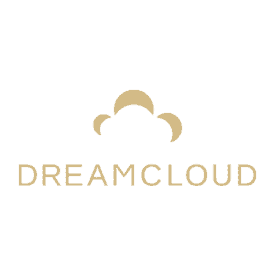 The folks from DreamCloud will bring it into your room, set it up for you, and even remove your old bed frame for you. This service is an extra $149, but if you’re trying to avoid any heavy lifting, it could be worth it. 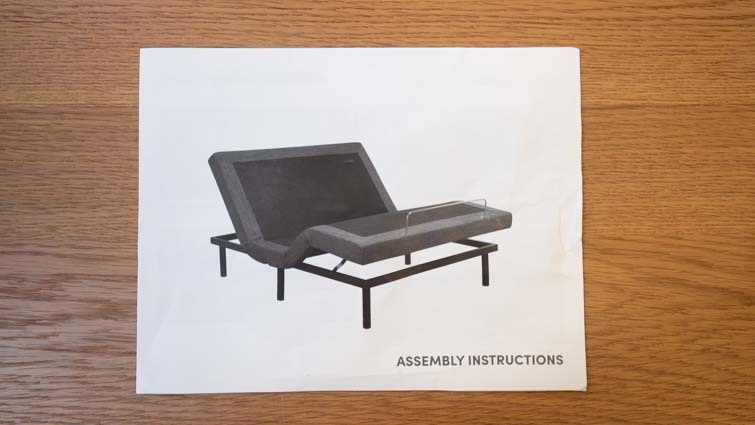 Assembly instructions come with every DreamCloud adjustable base. Of course, if you’re feeling handy and you do want to set everything up yourself, every base comes with easy-to-follow assembly instructions. Just remember though, if you don’t use the white glove service, get help from some friends. To reiterate, this base is very heavy. Unfold the base and attach the legs (you can tighten the legs with an allen wrench if you like). Attach the motors to the frame. Plug the color coordinating cables into their appropriate ports. Plug the adapter into an outlet. And voila! You just set up your adjustable base. How Does The DreamCloud Adjustable Base Work? Once your mattress is on the frame, and your base is ready for action, all that’s left for you to do is use your remote control! Every DreamCloud adjustable base comes with one remote control, and guess what? It’s already synced and ready to use. Not to mention, the remote buttons are pretty self-explanatory. But even if they weren’t, there is a labeled picture of the remote on the back of your assembly instruction manual, indicating exactly what each button does. This remote controls your adjustable base. Whether you’re adjusting the head or foot of the base, hold the button down until you’ve reached your desired position. And when you find a head/foot combination that is perfect for you, you can save it to your remote! This way, when you want to jump right back to that exact position, all you have to do is press one button. Sleepers have the option to preset up to three customized positions, and you save them to your remote using the M1, M2, and M3 buttons. Lounging on the DreamCloud mattress and adjustable base! It’s worth noting that while the DreamCloud adjustable base is easy to use, it’s not exactly whisper quiet. In my experience testing this base, I noticed a humming noise that occurs when it moves. For many, this is probably not a big deal… but I’ll admit I found the noise to be a bit off-putting. Additionally, the base changes positions very slowly, so some patience is required! Being able to customize your own positions is great, but the DreamCloud adjustable base does come with some fancy, preset features as well. 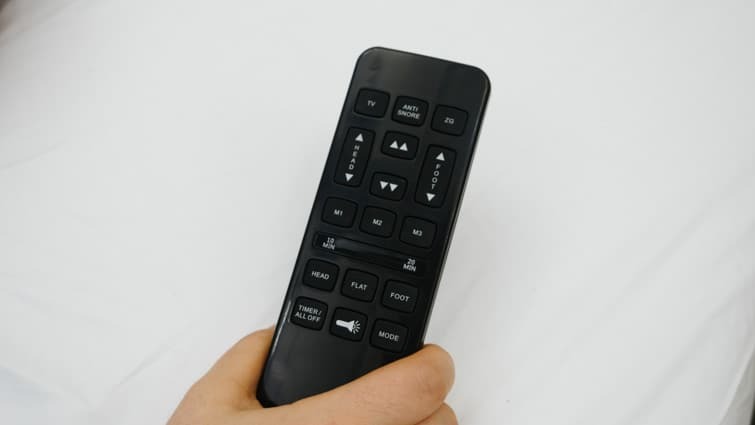 On the very top of the remote, there are three buttons labeled, “TV,” “Anti-Snore,” and, “ZG.” Each of these buttons accesses a preset position, and you only need to tap them once. As you might have guessed, the “TV” button brings the head of the base to a raised position. The idea, of course, is that you’re propped up enough to see the TV screen while still lying comfortably in bed. Propped up and ready to enjoy DreamCloud’s “TV” setting. The “Anti-Snore” button takes the base to a position that’s almost completely flat, but the head is raised ever so slightly. This position is meant to alleviate snoring, as lying completely flat on your back has been shown to disrupt your breathing. However, it’s still flat enough that sleepers can easily transition positions throughout the course of their slumber. Then there’s the “ZG” button (which stands for Zero Gravity), and this button takes the base to a position that’s meant to make the sleeper feel “weightless.” Essentially, it will angle both the head and foot of the base in a way that’s designed to optimize the user’s weight distribution, enhance blood flow, and provide supportive pressure relief. Personally, this is my favorite preset position! It gave me this feeling of floating on top of the mattress that I found to be exceptionally cozy. By now you might be thinking, “But Sarah, didn’t you say this base could do more than adjust mattress positions?” Well, behold the massage features! On the remote, there are two buttons labeled “head” and “foot” without arrows. Those buttons will activate the massage settings, and you can press the “mode” button to adjust the intensity of the vibration. And feel free to enjoy the head and foot massage simultaneously, or separately. As for me, I thought the massage felt similar to the vibrations that lull you to sleep during a car ride (and I love that). So, I kept both the head and the foot vibrating for 20 minutes! Enjoying the full-body vibrations of DreamCloud’s massage setting! Again, it’s worth noting that the massage vibrations are not completely noiseless — it makes a bit of a whirring noise. Personally, I found the vibration sounds to offer a soothing, white noise effect. Should you want to set a massage timer, simply use the button that reads, “Timer.” Press it once to set the timer for 10 minutes, and twice for 20 minutes. Beside the timer button is a button with a picture of a flashlight. If you want to do a little late night wandering to the kitchen (am I the only one who does this? ), press the flashlight button to illuminate your way. And there you have it, folks! Those are all the remote-accessible features of the DreamCloud adjustable base. But there is one more perk this base has to offer — USB ports! 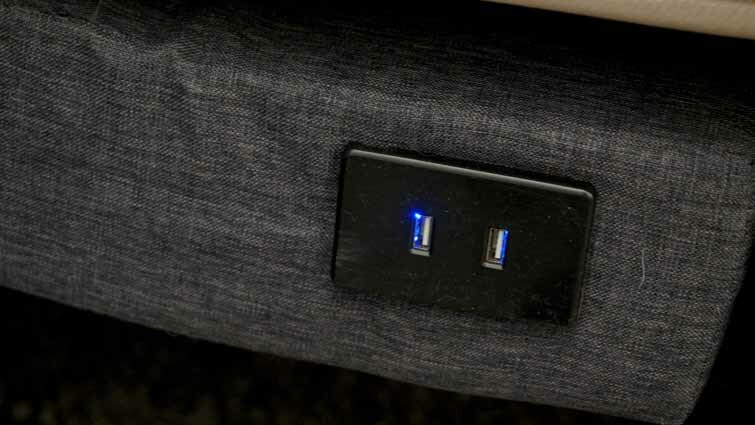 There are two USB ports on one side of the adjustable base, allowing you to charge your phone, tablet, and things like that (but don’t stare at your phone for too long before bed!). You can use this base to charge your phone! Should I Buy A DreamCloud Adjustable Base? So, we’ve seen what this adjustable base can do… But let’s recap its highlights one more time so you can decide whether it’s the right one for you! Customizable Settings — Sleepers can preset up to three personalized base positions. This way, your adjustable base is totally tailored to your unique sleep needs. DreamCloud Preset Positions — The remote comes with three positions already preset by DreamCloud. One to alleviate snoring, one to feel weightless, and one to binge-watch your favorite TV show. Massage Features — Sleepers can enjoy a little bedtime massage, and adjust the intensity of the vibrations to their liking. Charging Station — Two USB ports allow sleepers to charge their smart devices without ever having to leave the comfort of their bed. 50 Night Trial Period — You have 50 nights to test this base before you have to make any tough decisions!